Today marks the first day of my second semester of my sophomore year of college. As I think back to last semester and balancing school, church, boyfriend, friends, this blog, and other extra curriculars, I realize that I was taking on so much at one time and just going and going and going. It took a point of me breaking down in the middle of a conversation with a friend last semester to realize that I needed to take the time to just breathe. Up until that point, I'd been spending so much time relying on my own strength that eventually I caved because, well, I'm human. How could I hold myself up for so long? So yesterday, I kept getting the urge to paint, so I did. I'm no painter by any means, but I do love expressing my creativity through creative outlets, like painting, sculpting, crafting, anything, really. A word kept coming to mind all day yesterday, and the word was breathe. I think that this will definitely be my mantra this semester, seeing as how it is so important to take a step back to just reflect and relax every now and then. I kept the canvas simple; I wanted the word to be the focal point and to stand out from the background. I also used a frame I got for Christmas and filled it with paper to write a simple phrase on it. 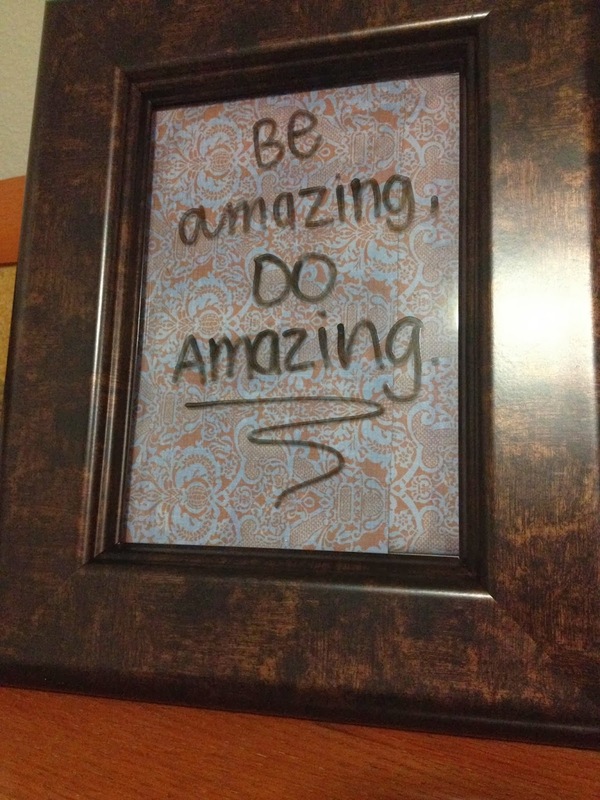 I went with "Be amazing, do amazing." To me, the quote simply means that in whatever you do, put your all into it. Make yourself and your work the best you can make it. I think that fits perfectly for this semester, and maybe even this year. As I go through this semester, I hope to keep both of these mantras in mind. I am ready for what's to come, and I'm just excited for what is going to happen. Let's do this! These are great mantras! It's surprising how hard it can be to stop and just breathe. Great post! These mantras are perfect to get through the semester! Each semester it gets a little easier to manage your time, but it's still a pretty difficult process. Breathing is key! Good luck, I know you'll do great! Love your painting! I love these mantras, I had a tough semester carrying a lot of schoolwork, work, and extracurriculars that I learned I just had to stop and breathe when times got too tough. Good luck on the start of a new semester! Aww, thanks so much Brienne! Love your craft and love these mantras - I need to remind myself of these always. These are always good to remember! Go watch 'Ever After' and that's a perfect film for this mantra. I instantly think of it because there's a gorgeous line of 'Just Breathe' before Drew Barrymore's character goes into craziness. Maybe you can watch it this weekend and be inspired. Enjoy your second semester! I'm glad that you are able to remember to just breathe. I'm going into my second semester of sophomore year, too, next week and I know reminding myself to breathe always helps! Aww, thank you! I will try to share more DIY's as I start getting more into them! Hi Kriselle. Your blog is a breath of fresh air. I'm taking your quote "Be Amazing, Do Amazing" with me! Definitely a great outlook. I'm a part of your SITS tribe and I am inspired by you! I featured this piece in my latest "Massive List of Links" post!